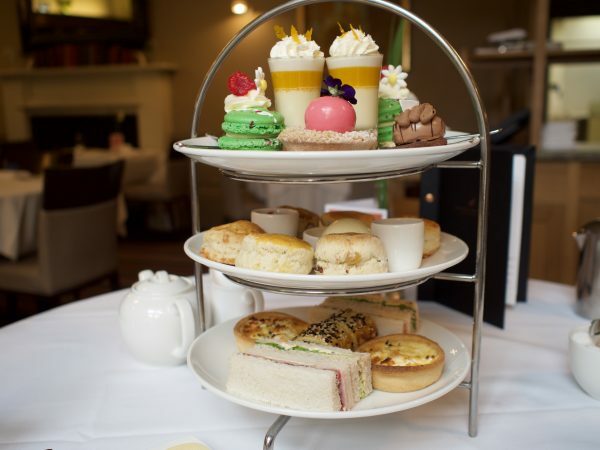 You may or may not know that afternoon tea was invented by Anna, the seventh Duchess of Bedford in 1840. She found that she got peckish in between lunch and dinner (let’s face it, who doesn’t?) and so asked her butler to bring her some bread and butter, cake and tea at around 4pm. 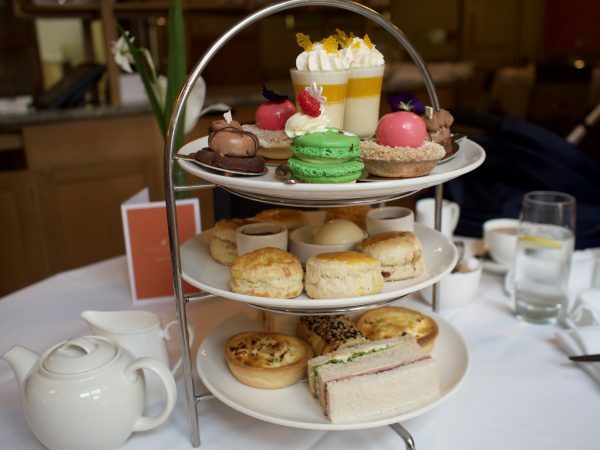 It became a trend as more people cottoned onto the fact that pigging out on dainty sandwiches, scones and cake is one of life’s great pleasures. Fast forward to 2018 and you can basically get afternoon tea anywhere, with varying degrees of success. The basic components, for me, are non-negotiable. They include good quality loose leaf tea, crustless finger sandwiches, crumbly homemade scones and a selection of dainty little cakes. As there is so much food to plough through it’s got to be interesting, delicious and thoughtful – it’s the ultimate treat to yourself and you’ve got to feel well and truly spoiled. 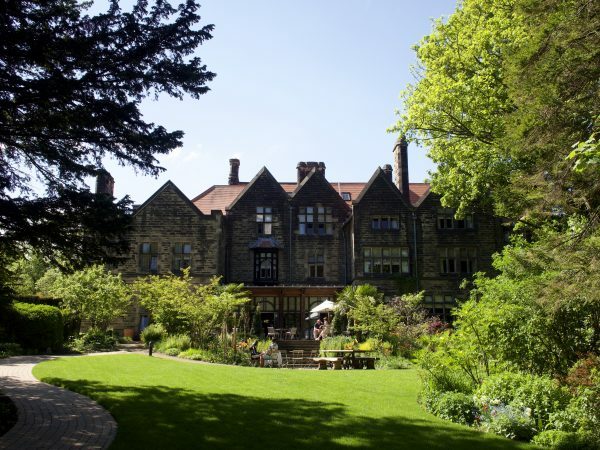 We arrived at Jesmond Dene House on one of these glorious May days we’ve been having. I say we, myself and my new baby girl were meeting my friend LR and her brand new baby boy for the first time so it was definitely an occasion worth celebrating! Our new addition on the left! As babies and direct sunlight don’t really mix, we sat inside but there were plenty of people soaking up the rays on the terrace (they have some parasols out there but unfortunately they were all taken). We were seated and given the menu so we could see what was coming and select a hot beverage from the tea menu. 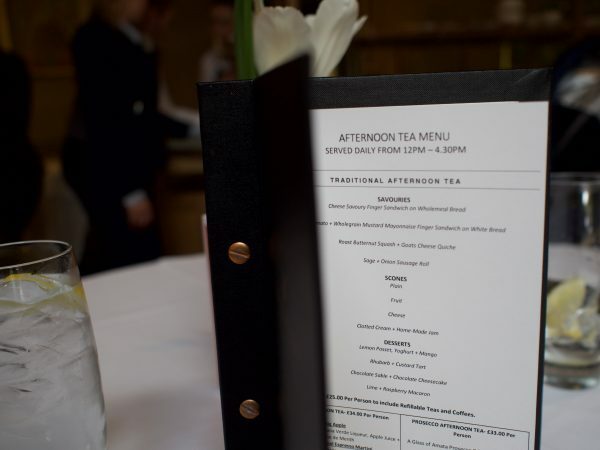 Oh yes, a tea menu! JDH take afternoon tea seriously. Finding it hard to choose, our waitress helpfully pointed out that as you get unlimited tea (or coffee) with their afternoon tea, I could work my way through the menu if I wanted to! I started with a traditional pot of earl grey and LR went for coffee, because sleep deprivation! 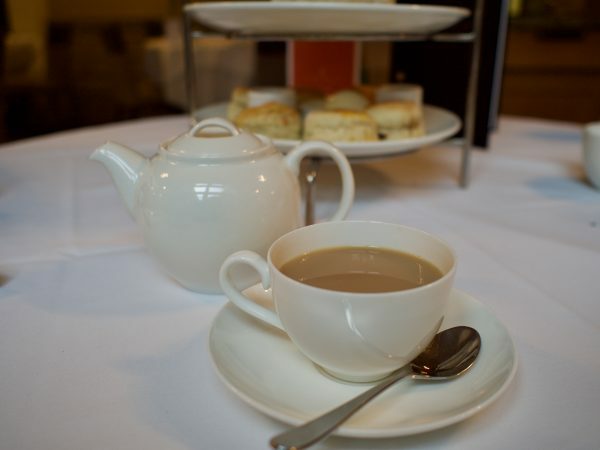 Afternoon tea at JDH is £25 per person, served 12pm – 5pm daily and you can upgrade to include a cocktail, prosecco or champagne. We didn’t have to wait long (or maybe the time just seemed to fly because we were so busy catching up!) for the pièce de résistance to arrive. The cake stand of treats arrived looking full of variety and naughtiness. The bottom layer featured not only sandwiches but also SAUSAGE ROLLS! It also had some lovely looking mini roast butternut squash and goats cheese quiche. We wasted no time getting stuck in. I went for the quiche and it didn’t disappoint. Crumbly, melt in the mouth pastry enveloped punchy, creamy goats cheese and butternut squash. Absolutely superb. Next I tried a sandwich. There were two options, a ham & tomato with mustard mayo on white and a cheese savoury on wholegrain bread. Both were crustless and freshly made, thankfully. Nothing worse than a crustless sarnie that’s gone crusty around the edges! Let’s take a moment to appreciate tea. Where would we be without a good cuppa? When said cuppa comes from a teapot, is loose-leaf and drunk from a teacup it transforms into a ritual and a delight for all the senses. This was one of those cuppas. I must admit that cheese savoury would be the very last filling I would choose if I was picking up some lunch but as far as it goes this was a good little hit of cheese, crunchy coleslaw, lettuce and mayo. The quantities of filling to sandwich were also spot on. The ham and tomato was equally well proportioned and balanced flavour-wise. If I was being picky, I would’ve liked to see something a bit more special like a smoked salmon and cucumber sandwich in there, I just think it would be a great complementary flavour and smoked salmon always seems like a real treat. The sage and onion sausage roll was a delicious little chubby parcel of well flavoured meat encased in pastry that Mary Berry would be proud of. A smattering of poppy and sesame seeds finished it off perfectly. A great start to proceedings all round. Next it was time for the scones. This afternoon tea features the holy trinity of cheese, plain and fruit scones and two types of jam – strawberry and raspberry. I went for the savoury option first and it didn’t disappoint. Crumbly and buttery, a swipe of good quality butter was all they needed to shine. The fruit and plain were equally good, especially with a dollop of clotted cream (always cream first!) and jam. The preserves tasted homemade, which wouldn’t surprise me as the attention to detail in this place is top notch. The discreet staff were just the right level of attentive but not overly so, and at this point I decided to try a different tea to go with the sweet treats. I fancied ‘Birds of paradise’ tea – a fruity blend of white & green tea from the Fujian region of China blended with marigold petals, safflowers and natural apple and peach flavours. I’m not usually a fan of fruit tea but this was a really nice refreshing beverage, not too overpowering and very palate cleansing. We were very excited to tuck into the dainty little cakes on the top tier. I started with the lemon posset with yoghurt and mango. The creaminess of the posset with the texture and sweetness of the mango and ever so slightly sour hit from the yoghurt was perfection. Add a smattering of dedicated coconut and caramelised sugar crisps on top and someone knows what they’re doing in the kitchen. By this point my baby was getting hot and bothered so I took her outside for a little walk around the gardens to try and get her to sleep. It was a little bit on the warm side in the restaurant, the air conditioning probably should’ve been on but we’re so un-used to heat in this country it’s hard to get the balance right! JDH has such a beautiful spot on the edge of the dene, surrounded by mature trees so popping outside for a walk is always welcome. 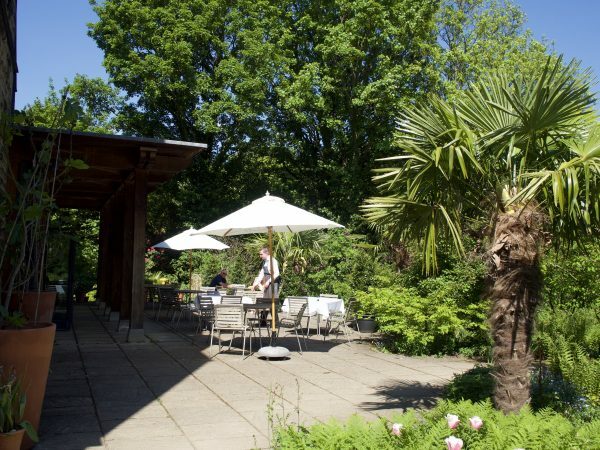 On a sunny day it’s a little oasis on the edge of the city. I came back inside to tuck into the desserts. 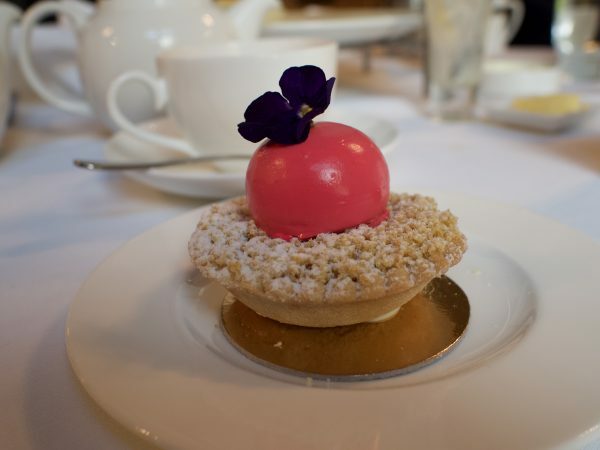 The rhubarb and custard tart featured a beautiful little purple dome of rhubarb flavoured mouse on top of a crumble tart, and was exquisite. Chocolate sable & chocolate cheesecake was a little bitesized treat, with french chewy chocolate biscuits topped with a cheesecake dome. The macaron was saved for last, it was almost too pretty to eat. Sweet and delicate, lime flavours were very delicate luckily as I wasn’t sure how it would work with raspberry but it did. Sandwiched with buttercream, it’s the ultimate in sweet confectionary and the perfect way to end the meal. LR hadn’t managed to finish and JDH are happy to provide a box for you to take anything you can’t finish home, which is great. We left very satisfied with our lovely afternoon of babies, chat, tea and treats. JDH have without doubt got one hell of a pastry chef in the kitchen. I’d highly recommend you check out their afternoon tea, it’s got to be one of the best in the Toon! 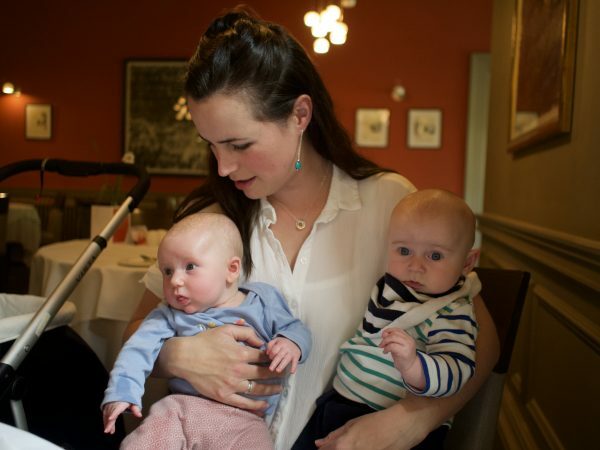 We were pleased to find out that St Mary’s Inn, which we reviewed back when Little Dude was just a little baba is to re-open next month after being mothballed for a year due to the surrounding property development being put on hold. We loved it back then and are looking forward to going and checking out their new menu soon. We were provided with a complimentary meal for the purposes of this review, however I paid for afternoon tea last month and had an equally positive experience. As always the opinions expressed in this article are honest and true to experience.